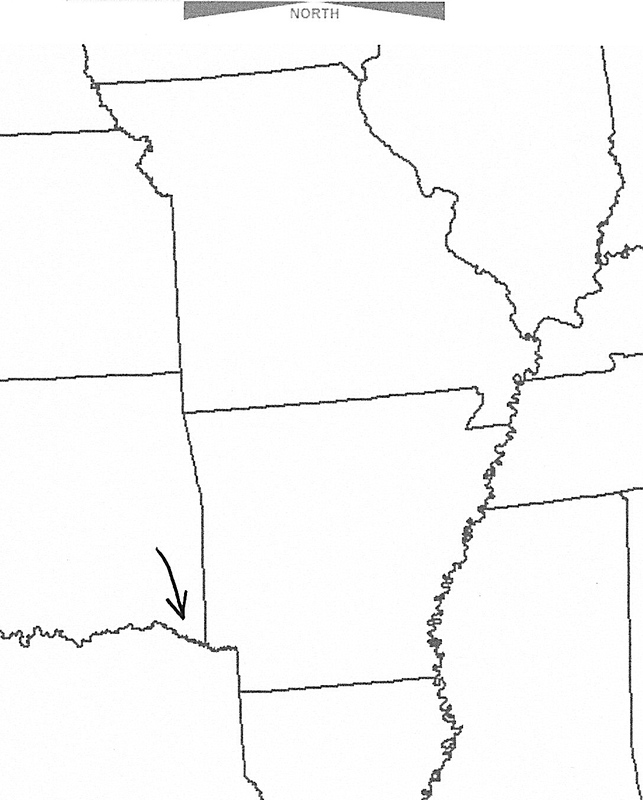 Arkansas began life as an almost rectangle that later had two notches carved out of it. When Congress started to divide up the Louisiana Purchase, a couple of historic decisions played a part in the shape of Arkansas that stands today. The original design of the border between Arkansas and Missouri was the same straight line which created the northern border of Tennessee. But a funny thing happened on the way to statehood. As described in an earlier post, a wealthy cattleman whose ranch covered a large portion of what is now the boot heel of Missouri saw the thriving gateway city that St. Louis had become upriver. He knew that if his land was part of Missouri rather than Arkansas it would have a much higher value, so he contacted a member of Congress and made some kind of backroom deal. In essence, he persuaded Congress to create that notch that is known as the Missouri Boot Heel so that he and his land holdings could personally benefit from the commerce, and thus the wealth, that came through St. Louis. On the opposite corner of Arkansas another chunk seems to be missing. The southern border of Arkansas was set at the 33rd parallel because President Thomas Jefferson understood the value of creating the state of Louisiana whose early settlers were primarily of French heritage. He liked the notion of keeping favor with French settlers by establishing a state that encouraged their unique community, so he gave them a northern boundary at the 33rd parallel, which in turn defined Arkansas’ southern border. But why the notch in the corner? To answer that we have to go back to the Louisiana Purchase of 1803. France owned the land that Thomas Jefferson bought, but the Spanish owned most of the land to the west. When it came time to establish exactly who owned what and where the lines should be drawn, the Red River was an important bargaining point (see the arrow on the map). In a decision that was called the Adams-Onis Treaty (the Adams in question was then Secretary of State John Quincy Adams), it was determined that the Spanish territory would follow the Red River until it reached the 32° N Latitude, at which point it would turn straight south. The result was a notch cut from the southwestern corner of Arkansas. This entry was posted in Uncategorized and tagged Adams-Onis Treaty, Arkansas, Choctaw Indians, Louisiana purchase, Missouri Boot Heel. Bookmark the permalink. I had to read this one twice–all that economic wheeling and dealing and political negotiating! What a remarkable history for that one state. I wish I had learned more history like this back in school–it adds so much to our understanding of U.S. history.